Much quicker g-force will need fuel. G-force acceleration will need a profile. For simplicity, Thought Experiment (TE) uses following typical values for a typical LOS distance from Earth to the planets. A g-force vessel could travel a LOS path much, much quicker then an orbiting vessel can travel a corresponding transfer orbit. 1Near Earth Objects (NEOs) are a class of asteroids/comets which occasionally come within one AU of Earth. ²Line of Sight (LOS) distance; straight line distance from Earth to destination. G-force ships would be able to approximate a straight line path, a much shorter distance then a semi TO. 3SemiOrbit (SO) Distance. Typical transfer orbits must travel an elliptical path for one half of the entire transfer orbit; much greater distance then LOS. 4Constant Acceleration for entire trip increases inflight velocity way beyond usability. For useful operations at destination (orbiting and/or landing), vessel must decelerate from about half way point. 5G-force Profile: Acceleration + Deceleration. For constant g-force throughout the entire flight; acceleration time/distance must equal deceleration time/distance. Therefore, it makes sense to reverse propulsion vector at mid-point (or mid-time) of our trip. If this body is the Sun (☉), it may also be called the heliocentric gravitational constant (μ☉). rτ, distance from Sol, varies for every point on the orbit. aτ, semimajor axis, stays the same value for entire orbit. MAXIMUM VELOCITY. For any given Transfer Orbit (TO), an orbiting object attains maximum speed when closest to the Sun, orbit's perihelion. Furthermore, these TOs always depart from orbit of Earth; so, perihelion is always 1 AU, semimajor axis of Earth ( a♁). AVERAGE VELOCITY. Divide transfer distance by transfer time to determine average velocity. As a cursory, cross check, the average velocity should be between min and max velocities. G-force propulsion gets us there via a straight line (i.e. "line of sight (LOS)"), and it attains very high velocities (much higher then orbital speeds. Diagram shows that constant g-force ever increases velocity; in turn, distance per day increases. To determine g-force velocities in kilometers per second (kps), recall that one day of g-force can accelerate our ship to about 864 km per second. g ≈ 10 m/sec per second = 864 kps per day. As a matter of fact, if we applied a consistent g-force vector all the way to Jupiter, TABLE-5 shows that ship velocity would achieve almost four thousand kilometers per second. 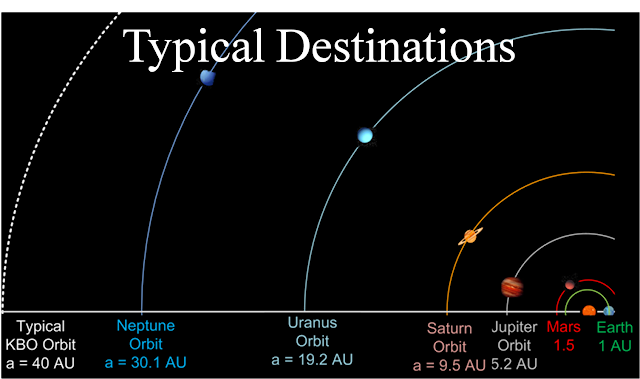 EXAMPLE: A typical LOS distance between Earth and Jupiter could be 5 AU (depends on relative orbital positions). 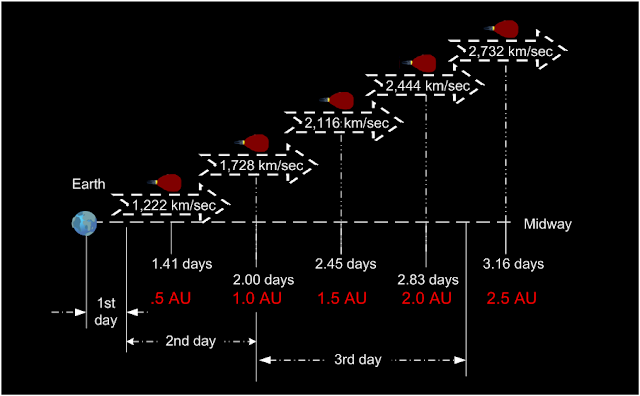 After 4.5 days of g-force, vessel would travel entire distance (5 AUs), but velocity would exceed 3,800 km/sec. This would be way too fast. Jupiter itself orbits the Sun at about 13 km/sec; at 3,864 km/sec, ship could not land, orbit or do anything except glimpse at Jupiter as it quickly passes by. To maintain constant g-force for entire flight, reverse propulsion vector at midpoint. G-force Profile: Acceleration + Deceleration. To choose the appropriate SLOWDOWN point, consider that we want constant g-force throughout the entire flight; thus, we want acceleration time/distance to equal deceleration time/distance. Therefore, it makes sense to reverse propulsion vector at midpoint (or midtime) of our trip. vIni At start of flight, initial velocity(vIni) is assumed to be zero for simplicity. vMax At midway, spacecraft attains maximum velocity, vMax. At this point, vessel's crew must reverse g-force vector to stop acceleration and start deceleration. vFin At end of flight, TE also assumes final velocity (vFin) to be zero for simplicity. There's no doubt that constant acceleration will make interplanetary travel much quicker. For this and other benefits of constant acceleration propulsion see below. Partial ellipse, as ship goes from one orbit to another. Straight line from dept. to dest. ⇓ No enroute propulsion constrains vehicle to the path of an elliptical orbit. ⇑ Constant g-force propulsion enables vehicle to closely approximate a straight line. ⇓ No enroute propulsion means unable to adjust flight path prior to intercepting destination orbit. ⇑ Adjust propulsion vector as required to maintain flight path. ⇓ Due to everchanging direction of flight, destination remains obligue throughout most of flight. ⇑ Line of Sight (LOS) really applies. Destination remains straight ahead, in full sight, throughout entire flight. ⇓ Launch Window must be considered. Since nonpowered flight must fly an orbit from dept to dest, duration will take years, thus considerable effort and waiting time required to sync prop dept from Earth to arrive at dest. ⇑ Launch Window is not important. Powered flight enables vehicle to fly LOS path from dept to destination at any time. Very slight lead required, which can be accomplished enroute. ⇑ Lots of time to prepare for mission at destination. Enough time to study entire college courses. ⇓ No time to train; crew will be extremely busy getting ready for subsequent flight phases. ⇑ Lots of time to establish essential relationships. Marry, have babies and many other things. ⇓ Much shorter durations barely give passengers enough time to know each other. ⇓ Cabin Fever! If ship's population is too few, lack of social interaction will likely cause severe depression amongst many of those onboard. ⇑ No time for cabin fever. ⇓ Eventually public will lose interest. Media will turn to other matters. ⇑ With impending mission accomplishment, public will more likely maintain interest for first few missions. Eventually, interplanetary g-force flights will become routine and will cease to be "news". other than small "burns" to change orbits. ⇓ Large Quantity Needed. Relative amount is small (very small %TOGW due to near light speed exhaust particles); however, even a small percentage could be thousands of tons). Quantity of food storage nearly impossible. ⇑ Still challenging, but transporting large pop for short durations has got to be easier then for long durations. ⇓ Quantity of food to be stored is more practical but still challenging. As pop shrinks, socializing opportunities correspondingly decrease. ⇑ Even for short durations, smaller populations have less problems then large pops. to impact ship and sicken on board organisms. to adversely affect construction process and performance. ⇑ Shorter durations mean fewer REMs. FORTUNATELY, g-force fuel (water) can effectively shield in-space radiation. Transfer orbital velocity stays within a relatively close range. ⇓ Indeed, need is great. Considerable energy is needed to g-force accelerate to enormous speeds at midpoint. Same amount of energy needed to bring velocity back to operational levels. Trade off for extremely short duration of flight. If course adjustments must be made, there is plenty of available propulsion capability to do so. ⇑ Continuous free fall can be fun! It might even prove useful, for example, takes less effort to move heavy loads. ⇓ No free fall until g-force is turned off. If that happens, ship stays at that velocity until g-force starts again. ⇓Long term effects of gravity deprivation can be substantial: muscles atrophy, bones get brittle, and other medical dysfunctions. ⇑ Maintaining Earth like gravity facilitates transitions to/from residing on Earth via residing in space. ⇓ Achievable but not there yet. Particle accelerators are old news and ion drives are new news, but maintaining a tightly controlled, consistent flow of kilograms per second for extended periods (days) is very much future news. Such a propulsion system remains a TE for now. TE is now absolutely convinced that g-force powered flight is much better for human occupied interplanetary flight. However, powered flight requires fuel. TE assumes propulsion vector to be a stream of near light speed particles exiting the exhaust port. --For first half of flight, propulsion vector points opposite to direction of flight (in the same manner that current rocket propulsion systems work). --For adequate slowdown, the spaceship must reverse the propulsion vector's direction at midpoint. SUMMARY: G-force profile uses constant stream of accelerated exhaust particles throughout the flight. TE assumes water as source of plasma (ionized particles to form propulsion stream), because it's plentiful, readily obtained and easily heated to steam, thence to plasma (just heat it!!). Water has many other useful qualities. --Expelling one gram per second at 10% light speed can propel a ship of 3 metric tons (mTs) with g-force. --1,000 grams per second (1 kg/s) can propel a 3,000 metric Tonne (mT) vessel (size of small ship or yacht). --1 kg/s at 20% light speed can g-force propel 6,000 mTs. TE farther assumes relativistic growth also contributes to propulsion effect of exhaust particles. For example, if original mass of 1 kg is accelerated to .866 c, then Lorentz Transform shows a doubling in size to 2 kg of exhaust particles. Thus, 1 kg/s accelerated to 86.6% light speed can g-force 50,000 mTs. From previous work, TE further simplifies by determining fuel requirements as a percentage of ship's Take Off Gross Weight (TOGW). Accelerate 1% of ship's initial mass (TOGW) to 86.6% light speed can propel ship for a g-force profile of 5 AU or 6 days. 2% of ship's TOGW can propel ship to 10 days. 3% TOGW can propel ship to the Kuiper Belt. TE assumes efficiency factor, ε, to account for ineffective use of exhaust particles. This is due to inevitable design flaws as well as peripheral energy needs. Efficiency factor increases fuel burn requirement. For simplicity, TE arbitrarily chooses 50% efficiency to consider energy required for nonpropulsion use. This includes: power generation, life support, and general inefficiencies bound to occur in any human designed system. Particle collisions with beam guide and/or other particles. Energy is needed to power accelerator's huge array of magnets and electric apparatus. Energy is needed for numerious peripheral devices as well as life support for onboard humans. To propel a ship of 3 metric tons (mTs) with g-force, ship's power system must consume 2 grams per second. Expelling one gram per second at 10% light speed. Allow for other gram to power peripheral devices and be consumed by design flaws. 2% of ship's mass is needed to propel ship for a g-force profile of 5 AU or 6 days. 1% of ship's mass actually accelerates t0 .866c and exits exhaust system. Other 1% is needed for nonpropulsion uses. it will no doubt improve as g-force technology advances. Gotta go AND come back. TE assumes it'll be a while before mankind learns to harvest fuel from spaceborne resources; thus, initial g-force missions will have to carry enough fuel to go and return. TE assumes that scope of interplanetary missions includes a return leg. Circumstances compell TE to further assume that fuel for return must be included in ship's Take Off Gross Weight (TOGW). Thus, TE must double fuel requirements from corresponding cells in Table 4. Onboard fuel must suffice to travel to destination and return since there are no other fuel supplies available. Very little fuel will be required for in orbit operations while at destination; we'll assume it to be small enough to disregard. Perhaps our interplanetary vessel will immediately discharge an orbiting payload and quickly return. Good judgment dictates considerable margin in addition to fuel planned for consumption during the two way trip. However, our thought experiment will live life on the edge and just determine how much fuel is needed to travel to our interplanetary destination and return. Incremental model (this one) is only an approximate model of fuel consumption but it's "good enough" for the few days required for interplanetary flights. Logarithmic model of fuel consumption is much more accurate, becauses it accounts for decreasing "gross weight" of spacecraft. For longer space flights, this must be used. Discussed in more detail in subsequent chapters.